For many years Alphacool has been a leader in the field of radiators. Due to the consistent use of pure copper for the cooling fins, antechambers and ducts, Alphacool radiators lead the field in terms of performance. The Alphacool NexXxoS radiators offer outstanding performance when using slow-speed fans and offer a high performance reserve when a lot of heat has to be dissipated. This allows them to cover a wide range of applications. The Alphacool Eisblock XPX cooler has repeatedly been voted the most powerful CPU cooler on the market in independent tests. In addition to excellent workmanship, care was also taken to ensure that the cooler base is large enough for CPUs that rely on eight or more physical CPU cores. If you want to customize your CPU cooler, you can use modding kits from Alphacool. The CPU cover, the screw caps and the mounting frame can be exchanged for other colors. With the Eisbecher Alphacool has launched an outstanding tank on the market which offers not only high quality and compatibility but also the well-known Lighttower water effect. The water flows up a riser tube and is then sprayed against the inside of the reservoir. A real optical highlight. The installation possibilities are also very extensive. The Eisbecher can be mounted directly on a radiator or with normal feet on the bottom of the case. The VPP755 Eispumpe is the further development of the classic D5 pump. It is quieter and more powerful than this one and also offers the possibility to control the pump manually or via the 4-pin PWM connector. The pump is about 1cm shorter and therefore more compact than a classic D5 pump. The entire pump is enclosed in a stable and extremely noble aluminium cap. The new Eiswind fans of the Silent Edition are based on the worldwide popular be quiet! fans. The finely ribbed fan blades ensure optimum air flow and targeted turbulence to minimize background noise. A fluid-dynamic bearing with a service life more than three times longer than a classic rifle or sleeve bearing. A further advantage of this elaborate fan bearing is its extremely low inherent vibration, which benefits the overall volume. The fans can be controlled via the 4-pin PWM connector over a wide speed range. Alphacool makes no compromises when it comes to connections. All connections are from the high-end Eiszapfen series and are made entirely of anodized brass. Thanks to the wide ribbed outer surface, the connections can be screwed in very easily. The union nut presses the hose firmly against the connection and contributes to safety. The enclosed quick release fastener makes the set Eisbaer Ready. Many products such as the Eiswolf GPX-Pro cooler, the external water cooling solution Eiswand and other Alphacool products rely on this quick release fastener. In this way, they can easily and quickly combine or separate the products from each other again. The set includes everything you need for the start. Hoses, the necessary liquid, a filling aid, Y-adapter for the fans and much more. The manual is very extensive with many pictures describing all parts in their function. 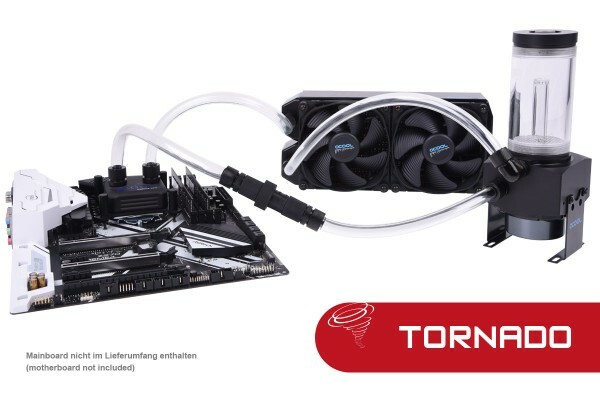 With an ice storm set you get the perfect set for your water cooling. 1 Review(s) in other languages.